One of the leading companies in Europe in terms of providing it's customers worldwide with fast, flexible and reliable solutions. The Company operates a big fleet of bulk carriers, cement carriers and MPP vessels. A company operating a fleet of bulk carriers, self-unloaders, belt-dischargers, trans-shippers and cement carriers. A definite leader in the South-North American trade. Excellent choice for any seafarer. A German shipowner, successfully operating a fleet of coasters, MPPs, bulk carriers, Container vessels and RO-RO. Worldwide trading. New vessels and excellent career opportunities for any seafarer. An Italian agency operating a fleet of off-shore vessels. A Greek Shipping Company with a history of more than 40 years. Offers competitive wages and excellent work conditions for the seafarers. The biggest and definitely the best provider of support services to the seafarers such as visa, flights, transportation. Certification center providing the seafarers with STCW documentation. A Greek ship managing company with an excellent reputation. Seapal Marine Inc. is an established Manning Agency in Piraeus since 1980. Soon after its start of activity, our Company has gained a notable reputation and widespread recognition among the Maritime Communities of Europe. 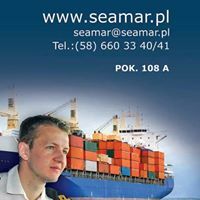 Established in 2006, SEAMAR s.c. is a licensed recruitment agency providing crews to ships operated by foreign companies, one acting also as a full-scope crew management to some of them.